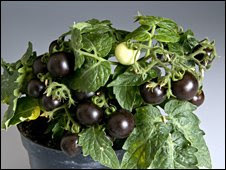 Scientists have developed purple tomatoes which they hope may be able to keep cancer at bay. The fruit are rich in an antioxidant pigment called anthocyanin which is thought to have anti-cancer properties. A team from the John Innes Centre, Norwich, created the tomatoes by incorporating genes from the snapdragon flower, which is high in anthocyanin. The study, published in Nature Biotechnology, found mice who ate the tomatoes lived longer. Anthocyanins, found in particularly high levels in berries such as blackberry, cranberry and chokeberry, have been shown to help significantly slow the growth of colon cancer cells. They are also thought to offer protection against cardiovascular disease and age-related degenerative diseases. There is also evidence that the pigments have anti-inflammatory properties, help boost eyesight, and may help stave off obesity and diabetes. The John Innes team is investigating ways to increase the levels of health-promoting compounds in more commonly eaten fruits and vegetables. Tomatoes already contain high levels of beneficial antioxidant compounds, such as lycopene and flavonoids. Professor Cathie Martin, from the centre, said: "Most people do not eat five portions of fruits and vegetables a day, but they can get more benefit from those they do eat if common fruit and veg can be developed that are higher in bioactive compounds." The John Innes team took two genes from snapdragon that induce the production of anthocyanins in snapdragon flowers, and turned them on in tomato fruit. Anthocyanins accumulated in tomatoes at higher levels than anything previously achieved in both the peel and flesh of the fruit, giving them an intense purple colour. Tests on mice bred to be susceptible to cancer showed that animals whose diets were supplemented with the purple tomatoes had a significantly longer lifespan compared to those who received only normal red tomatoes. Professor Martin said: "This is one of the first examples of metabolic engineering that offers the potential to promote health through diet by reducing the impact of chronic disease. "And certainly the first example of a GMO [genetically modified organism] with a trait that really offers a potential benefit for all consumers." She said the the next step would be test the tomatoes on human volunteers. Dr Lara Bennett, of the charity Cancer Research UK, said: "It is exciting to see new techniques that could potentially make healthy foods even better for us. "But it is too early to say whether anthocyanins obtained through diet could help to reduce the risk of cancer. "We do know that eating a healthy, balanced diet that is rich in fibre, fruit and vegetables - and low in red and processed meat - is an important way to reduce your cancer risk." Dr Paul Kroon, of the Food Research Institute in Norwich, said the research was an "important study". "The technology offers great scope for altering colours of fruits and vegetables, and their content of potentially health-protective compounds." However, he said it would be wrong to assume the effects seen in mice would necessarily occur in humans. Anna Denny, a nutrition scientist for the British Nutrition Foundation, stressed there was no "magic bullet" against diseases such as cancer and heart disease. "Fruit and veg with higher levels of health-promoting compounds should not been seen as a replacement for eating a healthy balanced diet."